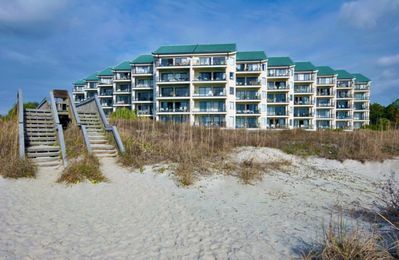 Our Ocean retreat is located in the gated community, The Moorings, within Palmetto Dunes Oceanfront Resort. It is Unit 19. 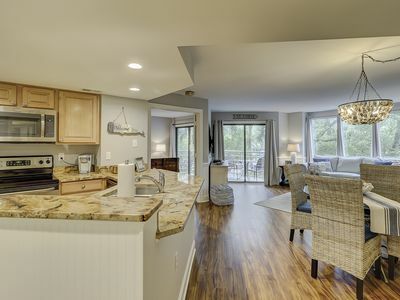 The 2-Bedroom, 3 full-bath unit has been beautifully renovated and is personally maintained by our staff located on the Island. 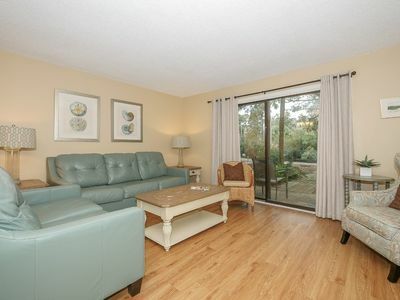 The unit is 1260 square feet and provides ample space for families or multiple couples. 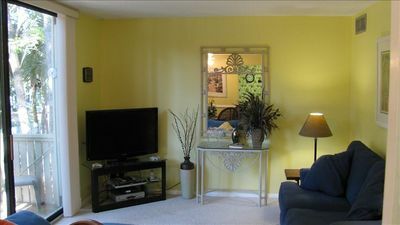 The living room has a 50' Plasma Flat Screen TV with a Bose surround sound Stereo/DVD system. 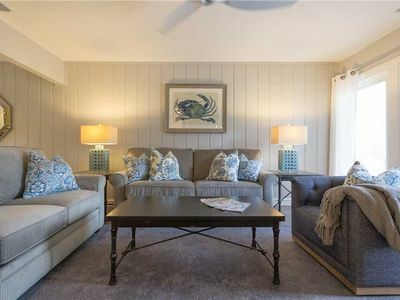 The room is perfect for watching the big game, your favorite movie, or enjoying cocktail hour with music. 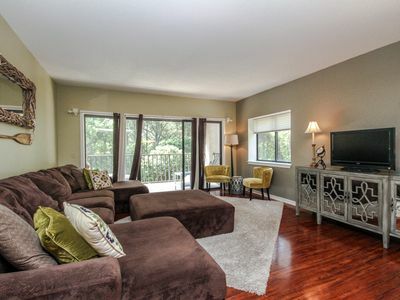 The family room also includes a queen sized sleeper sofa. The Master Suite has a king-sized bed, full bath, and a 36' Flat Screen TV and a Blu-Ray DVD player. The second bedroom has 2 full-sized beds, a full bath, and a 42' Flat Screen TV and a Blu-Ray DVD player. 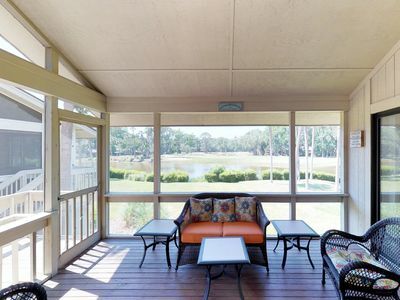 The living room and bedrooms all provide access to two wooden decks for taking in the natural beauty of the area. A third full bathroom (with shower) is located off the hallway. 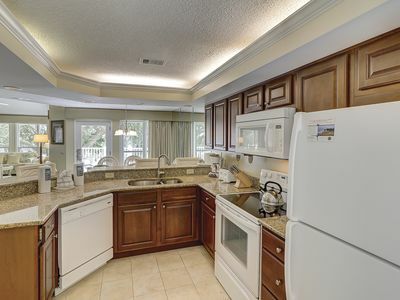 The kitchen is fully-equipped and includes a brand new stainless steel stove and microwave. The unit also has its own new washer and dryer. Next to the unit is the Moorings Private Pool. The beach is just a short chip shot from the front-door. The proximity of the beach enables many back-n-forth trips and means that you do not have to drive and unload your car (or look for parking). 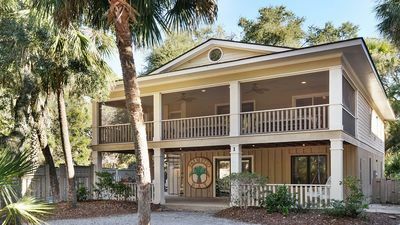 Located at the beach entrance is the Dunes House, which provides clean restrooms, as well as a seasonally-operated Bar and Grill (we recommend the fish tacos, shrimp and cold beer). 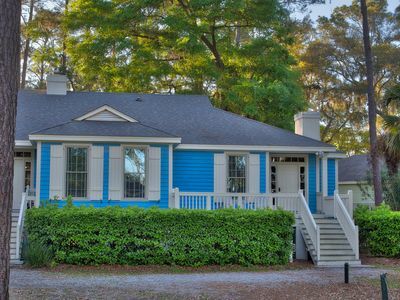 Also just a short walk from the front door is the Palmetto Dunes Tennis Center, the Robert Trent Jones golf course, The General Store (groceries, take-out, beach supplies and more), Alexander's Restaurant, and bike, kayak/canoe rentals. 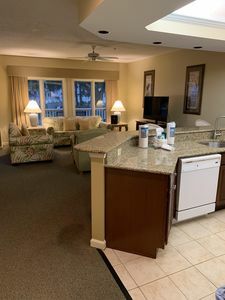 The unit is next door to the Marriott Beach Resort and Spa, which offers 2 restaurants, bars, children's camps, spa services, and even Starbucks Coffee. 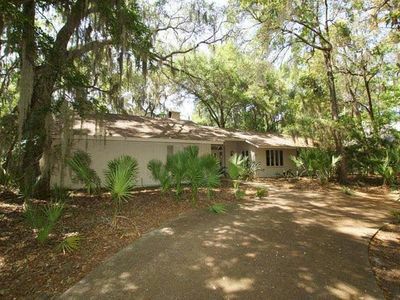 Palmetto Dunes is famous for its 3 world class golf courses, including George Fazio, Arthur Hills, and Robert Trent Jones, and also boasts miles of beautifully landscaped bike/walking trails (and even a tunnel under Rte. 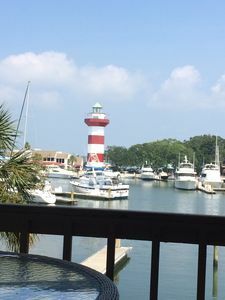 278 to Shelter Cove Marina, a waterside collection of restaurants, shops, entertainment and boat/fishing charter rentals). Palmetto Dunes also provides free shuttle service to Shetler Cove and other island locations. 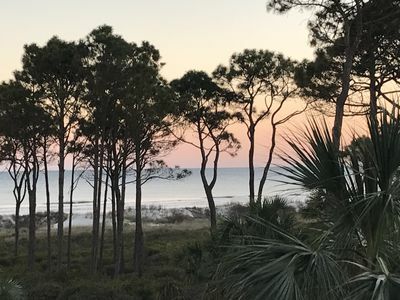 *8-10% off tee times at all three Palmetto Dunes Golf Courses: Arthur Hills, george Fazio and Robert Trent Jones Oceanfront. 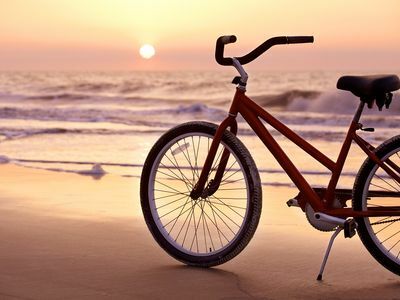 *10% off all bike, kayak and canoe rentals at Hilton Head Outfitters. 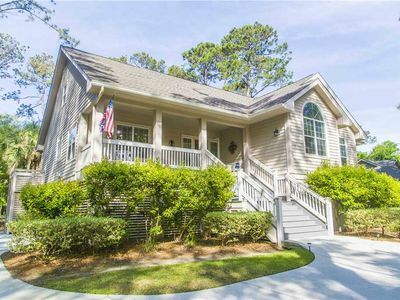 Luxury Home - Sleeps 16 -150 Yards from the Beach! Enjoy a waterfront view of Harour Town from your own balcony! 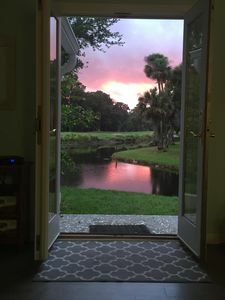 Bliss Cottage on Daufuskie - Pet Friendly - Pool! 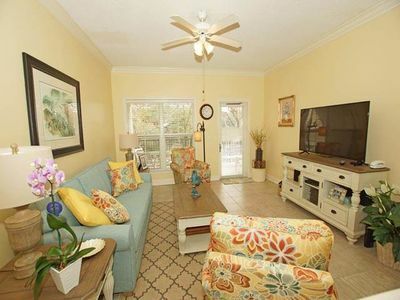 - 2 minute walk to beach! 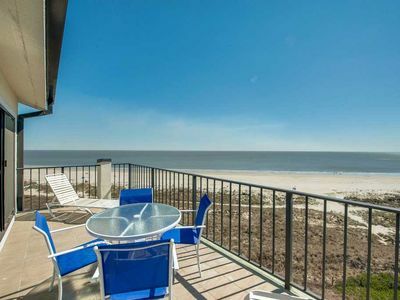 Spectacular Oceanfront Condo on Beautiful Folly Field Beach, Hilton Head! 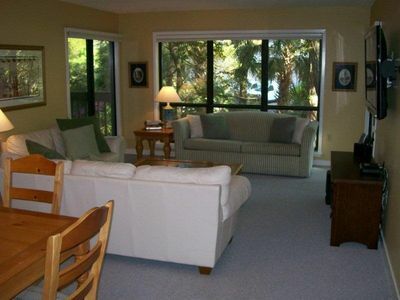 Comfortable Hilton Head condo with a shared pool, close to beach!